Here is a one-volume history of the Christian people from Pentecost to the present day, with principal focus on the Catholic Church. Having passed AD 2000 it seems appropriate and necessary to have a new short history of the first two millennia of the Christian era. In the last half century there has been a massive amount of research into Church history, published in learned articles and in multi-volume works. Full notice is taken of these recent scholarly initiatives in writing this short account, which is also eminently readable. In each section there is a balance between the institutional and the more directly religious dimensions of the Church - here are some of the elements: bishops, canon law, charity, councils crusades, devotions, heresies, laity, liturgy, martyrs, missionaries, parishes, pilgrimages, popes, prayer, priesthood, religious orders, sacraments, schools, theologians, universities and the vita consacrata. The scope is wide; the pace of the narrative is attractive. 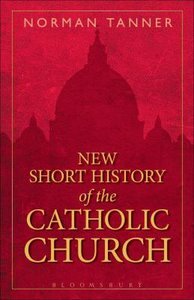 About "New Short History of the Catholic Church"
Tanner is lecturer in Medieval History at Campion Hall, Oxford University, and in Church History at Heythrop College, London University. 1. The Early Church; 2. The Middle Ages Part 1; 3. The Middle Ages Part 2; 4. Reformation And Counter Reformation; 5. The Modern Era.